Are you hungry? お腹すいた？= Onaka suita? Today’s lesson is about ordering food at fast food restaurants. A few people have been asking for me to make a lesson about fast food restaurants for a while, and I finally found some time to work on it. You may think you don’t need so much Japanese at a fast food restaurant. But I think you’ll find it useful and you’ll know what you are being asked and how to order what you want. I’ve included a lot of phrases that you may hear at a typical fast food restaurant. At a regular American style fast food restaurants. = Otsugi no kata douzo! = Otsugi de omachi no kata, douzo. = (Literal meaning) The next person who has been waiting please go ahead and order. = Moushiwake gozaimasen. Junban ni gochuumon wo ukagatte orimasu. = We are very sorry, but we are taking the orders in order. = Achira no retsu ni onarabi itadakemasu deshouka? = Could you stand in that line, please? = Thank you for waiting. = Kochira de omeshiagari desuka? = (Literal meaning) Are you going to eat here? = Are you eating in? = Tennai de omeshiagari desu ka? = (Literally) Are you going to eat in the store? = (Soretomo) omochikaeri desu ka? = (Literal meaning) I will eat here. = For here/ Eating in. = Teiku auto de, / Teiku auto shimasu. = (Sore de wa) gochuumon wo oukagai itashimasu. = (Literal meaning) I will take your order now. = Can I take your order? = Kochira de gochuumon wo oukagai itashimasu. = I will take your order (now). = Gochuumon wa okimari desuka? = Are you ready to order? If the menu list at the counter has all the pictures of food and prices, even if you don’t speak Japanese well, you can just point at the picture of the food you like and say これ( = kore), this one , and add お願いします。( = onegai shimasu. ), please. = Kore hitotsu onegai shimasu. = One of this please. I will teach you the most general counters here. 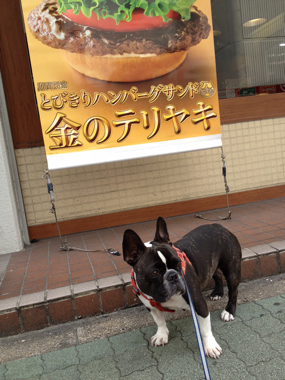 = One cheeseburger and one filet-o-fish please. = Biggu makku ohitotsu desune. = One big Mac, right? Note: They add お(=o) in front of the number to sound more polite. = Setto ni saremasu ka? = Would you like to make it a combo? = Does that come in a set or combo? = Kochiraga setto menuu to natte orimasu. = This (These) is/ are the set meal. = Poteto ka sarada kara oerabi itadakemasu. = You can order french fires or salad. = Onomimono wa ikaga desu ka? =Would you like something to drink? = What size would you like? = Saizu wa ikaga nasaimasuka? = One medium size Sprite (please). = Koohii hitotsu onegai shimasu. Usually you count a cup of coffee as 一杯 ( = ippai) but you can say 一つ( = hitotsu) for ordering coffee at a fast food store. = Aisu desuka ? Hotto desu ka? = Iced coffee or hot coffee? = Koohii niwa esu/ emu / eru to mittsu no saizu ga gozaimasu ga.
= There are three sizes for coffee, Small, Medium and Large.. If you are at a Starbucks, you have to be more specific. = Kafe moka no shooto hitotsu onegai shimasu. = One short Cafe Moca please. = Tooru no maccha kuriimu furabechiino, chokochippu tsuika de shiroppu nuki de onegai shimasu. = One tall Maccha cream frappucchino with chocolate tips and without syrup please. = Shooto no kyarameru makiaato wo tounyuu de oneagi shimasu. = One short Caramel Macchiato with soy milk, please. = Saido oodaa wa ikaga desuka? = Poteto wa ikaga desu ka? = Would you like french fries? = Saizu wa emu de yoroshikatta desuka? = Will medium size be OK? If you go to a sandwich store, you have to choose the type of bread you like. = Pan no shurui wa ikaga nasaimasu ka? = What type of bread would you like? = Doresshingu wa dore ni nasaimasu ka? = Which dressing would you like? = Okonomi no doresshin wo oerabi kudasai. = Please choose the dressing you would like. = Hanii ootsu wo regyuraa saizu , barusamiko soosu de onegai shimasu. = With regular size Honey oats bread and balsamic sauce please. = Extra toppings are available for an additional charge. = Tsuika ryoukin de toppingu wo oerabi itadakemasu ga ikaga desu ka? = You can choose the toppings you’d like for an extra charge. = Oyasai wa subete oire shite mo yoroshi katta deshouka? = Will be it OK if I put in all the vegetables? = Gu wa subete iremasu ka? = Do you want it with everything? = Hai, zenbu irete kudasai. = Yes, put all of them please. = Tamanegi igai, subete irete kudasai. = Everything but onions please. = Tamanegi nuki de onegai shimasu. = Hai, pikurusu oome de onegai shimasu. = Yes, a lot of pickles please. = Tamanegi sukuname de onegai shimasu. = With less onions, please. = (Pan wa) Toosuto saremasuka? = Would you like it toasted? = Would like to make it a combo? = Ookii saizu wo chuumon shitara watashi yori ookikatta no. = I ordered a large but it ‘s even bigger than me…. Sometimes they suggest a special menu. = Kochira kikan gentei de teriyaki chikin baagaa ga gozaimasu ga, ikaga de shouka? = Would like to try our special teriyaki chicken burger? It’s available for a limited time only. = Shinsaku no banana keiki mo ikaga desuka? = Would like to try our new banana cake,too? = I will try it next time. = Setto menyuu wa arimasuka? = Do you have a set meal? = Dorinku setto onegai shimasu. = One “drink-set” meal please. = Happii setto hitotsu onegai shimasu. = One Happy Set please. = Onomimono wo oerabi kudasai. = (literally) Please choose drinks from here. =What would you like to drink? = Onomimono wa kochirakara oerabi kudasai. =Please select your drink from these. = Dorinku wa kono naka kara oerabi itadakemasu. = You can choose your drink from here. = Jaa kapuchii no de. = Then I’ll have a Cappucchino. = Purasu gojuuen de kyaramerurate ka kaferate ga oerabi itadake masu ga.
= If you pay 50 yen extra, you can get caramel Latte or Cafe Latte. = Hoka ni gochuumon wa yoroshikatta desu ka? = Would like to order anything else? = Gochuumon wa ijou de yoroshikatta deshou ka? = Will that be all? = Gochuumon wo kakuknin sasete itadakimasu. = Let me confirm your order. = Daburu baagaa hitotsu to poteto no emu wo hitotsu. Ijou de yoroshii deshouka? = One double burger and one medium french fries. Will that be all? = Chiizu baagaa ohitotsu, emu saizu no poteto ga ohitotsu, emu saizu no koora ohitotsu de omachigai arimasen ka? = One cheeseburger, One medium french fries and one medium Coke. Is that right? 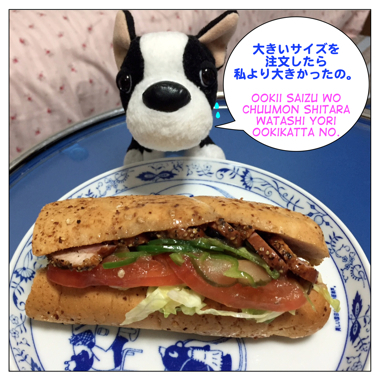 = Sumimasen, ato chikin nagetto mo onegai shimasu. = Sorry. I would like to order chicken nuggets as well. =(Literally) Please take your time. = Please enjoy your meal. = Can I have a straw? = May I have a straw please? = May I have some ketchup? = Gamushiroppu wa doko ni arimasu ka? = Where’s the sugar syrup (portion syrup)? = Fooku (wo) mouippon kudasai. = May I have another fork, please? = Sumimasen, supuun arimasu ka? = Excuse me. Do you have a spoon? Sometimes your need to wait your order somewhere else. Or you get a number and they will call you out when your order is ready. = Achira no kauntaa de omachi kudasai. = Please wait at the counter over there. = Kochira no bangou wo omochi kudasai. = Dekiagarimashitara bangou de oyobi itashimasu. = (Literal meaning) the person who has been waiting with Number 10. = (Literal meaning) A customer (person) who is waiting with a number 10. = Shooto no hanii miruku rate de omachi no okyaku sama. = (literal meaning) A customer/ a person who is waiting for short honey milk latte. = Teiburu de omachi kudasai. = Oseki de okake ni natte omachi kudasai. = Please sit down and wait. = Oseki made omochi itashimasu. = We will bring your order to your table. = Okaikei wa kochira de onegai itashimasu. = Okaikei senen ni narimasu. = That’ll be 1,000 yen. = Torei wa doushitara ii desu ka? = What should I do with the tray? = Sonomama de kekkou desu. = Torei wa achira ni omodoshi kudasai. = Please take your tray over there. = Toire wa doko desuka? = Otearai wa doko desu ka? Fast food is not just hamburgers or fried chicken. That might be a little challenging for you because a lot of places don’t have English menus. = Eigo no menyu wa arimasu ka? = Do you have an English menu? = (Moushiwake gozaimasen. ) Arimasen/ Oite imasen. 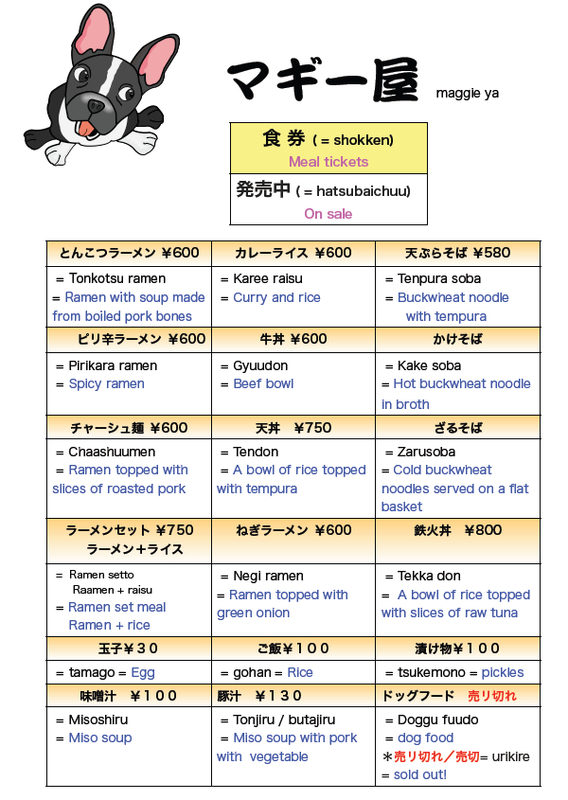 And there are places you have to buy 食券(=shokuken) meal tickets. So in this section I will give you the basic vocabulary that you may see/hear at Japanese fast food restaurants. = Shokkenwa achira de omotome kudasai. = Please buy meal tickets over there. = Mazu shokken wo katte kudasai. = Buy meal tickets first please. = Shokken wa doko de kattara iidesuka? = Where can I buy a meal ticket? = Shokken no kaikata ga yoku wakaranai node oshiete itadakemasu ka? = I don’t know how to buy a meal ticket. Could you tell me how to buy a ticket? You also use it to describe the quality of food. If you see the word 上 ( = jou) it means “good” and 特上( = tokujou) means “excellent”. So the price will go up naturally. Changing the order in a set menu. Paying money to a vending machine shouldn’t be too difficult. There are slots for bills and coins. = I can get any change back. = Senen ireta no desu ga otsuri ga demasen. = I paid one thousand yen but I can’t get the change back. I made a sample vending machine for マギー屋 ( =Maggie ya). There are many kinds of ramen but basically you choose the type of soup. 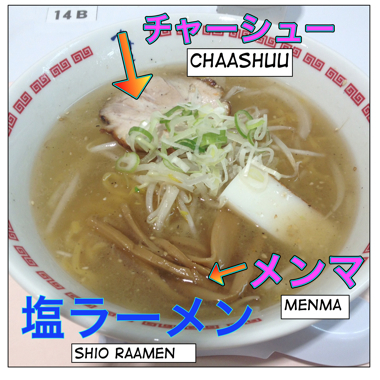 *豚骨ラーメン= tonkotsu ramen = ramen with soup made of pork bone. = Miso raamen ippai onegai shimasu. = One miso ramen please. = Shio raamen oomori de. = Ninniku wa irenai de kudasai. ＝ Ninniku nuki de onegai shimasu. = Refill of the noodle please. Note: Usually we serve rice in ご飯茶碗 = gohan jawan = rice bowl. *海鮮丼 = kaisen don / kaisen donburi = fresh seafood (sliced sashimi (raw fish) ) on rice, etc. = With more green onions please. = No green onions please. 冷たい (= tsumetai ) cold or 温かい ( = atatakai) hot noodles. 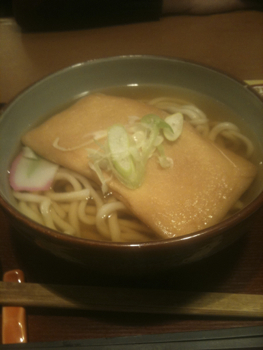 The word かけ ( = kake) (←掛ける= kakeru) , it means to pour something onto the noodle. When you see the word つけ ( = tsuke) (←”つける = tsukeru” ) and it means “to dip”. So they serve sauce separately and you dip the noodle into the sauce. 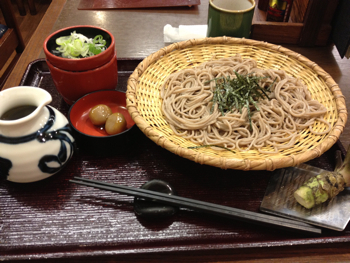 They serve cold noodle in the bamboo basket called ざる( = zaru) and you eat the noodle dipped in cold sauce. = Zaru de onegai shimasu. = Kake de onegai shimasu. = (Hot) Noodles in hot dashi soup, please. Whew. This turned out to be another long lesson. Here are links for my other food related lessons. = Watashi no osusume wa raisubaagaa desu yo. = Nihon ni kitara, zehi tabete mite kudasaine. = You should definitely try it when you come to Japan. This is one of my favorite lessons of yours. Getting food is something I always have trouble with when I travel, and I love eating out, so… But I have never seen anyone give so much detail about “what will happen when you go to [insert place]” as you. I like that you always think of as many situations as possible. Thank you so much! Haha I know this lesson is long but I am glad to hear you like it. Hi Maggie sensei! Thank you so much for all your detailed and helpful posts! You can use this pattern. = banira to maccha no emu saizu wo koon de onegai shimasu. = Emu saizu no banira to maccha wo koon de onegai shimasu. When I order meat, do they ask the equivalent of “how would you like it cooked”? What would that be, and how would I respond? = Oniku* no yakikagenn wa dou shimasu ka? / (more polite) ikaga nasaimasu ka? = rea/midiamu rea/mediamu/werudan de onegai shimasu. = rare/medium rare/medium/well done please. Hi Sensei Maggie, I am so happy to have discovered your site! I will be travelling to Japan in two months and I don’t have much time to learn Japanese. I bought some books and downloaded some applications, but I am still not satisfied. Your site is great! How exciting! You will be in Japan in two months. That will be an ideal season to travel around Japan. = (Soshite) Tsuma niwa ~ onegai shimasu. = (and) For my wife, ~~ please. = (Soshite) Kanojo niwa ~ onegai shimasu. = (and) For her, ~~ please. = Watashi wa koohii de, kanojo wa koucha wo onegai shimasu. = I will have a coffee and she will have a blacktea, please. Order two meals at the same time. = A to B onegai shimasu. And when they bring the plates, they will ask which one is for whome. = This one is mine. or point at the plate for your wife and indicate your wife. = Kore wa kochira ni onegai shimasu. = This one should be here, please. Then they can figure out. Can I have 2 more each for the creamer and syrup? why dont we use onegaishimasu here? can we replace it? お願いします。= onegai shimasu. = ~~~ please. Maggie,thank you for this. Watashi wa Nihonjin hanbun. Nihonjin to amerikajin demo nihongo chouto hanashimasu. I work in a dunkin donuts in America and sometimes when a Japanese customer comes in I try to speak Japanese. This lesson is exactly what I was looking for. My goal is to learn enough Japanese to work in a Japanese restaurant in the area. Thank you for your comment! I am very happy to hear you found this lesson useful. I hope you can find a nice job in Japan. I just wanted to ask what you should say when leaving a restaurant, something in the line of “Have a nice day”. I´ve heard people say “otsukaresama”, but i thought that was for coworkers only. You are right. Otsukare sama is strange. I can not express how grateful I am for this post, it is so fantastic and useful. Next time I go to Japan I will definitely use this! You are amazing Maggie sensei! I am SOOOO HAPPY to hear this lesson is useful. Hope you get to order anything you want when you visit Japan.